Last month, on the 20th March, spring arrived and it was the celebration of Ostara. This festivity celebrates the spring equinox, when the length of day and night are equal and the point from which the day length starts to increase. This celebration is dedicated to the goddess Eostre. Associated to that goddess are the eggs and the hare. Eggs are a symbol of fertility and renewal and the hare was what we can call, with all my respects, Eostre’s pet. 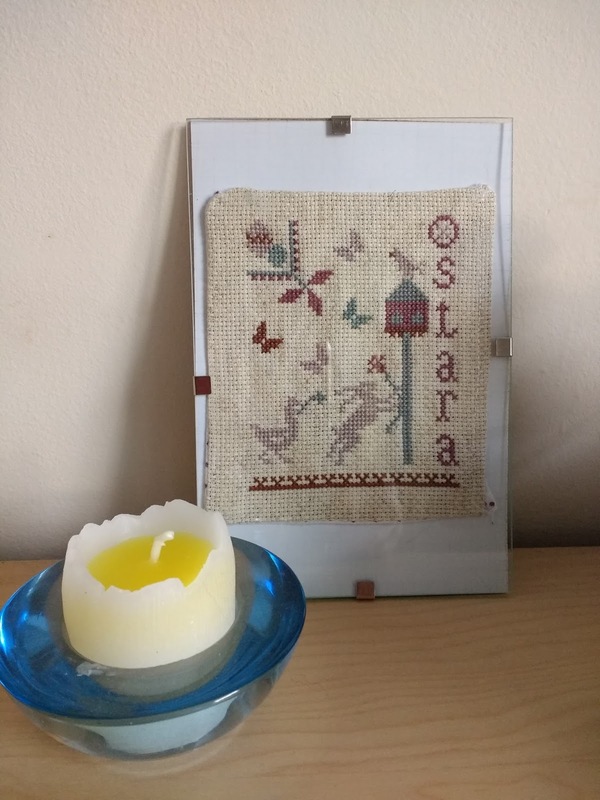 To celebrate Ostara, and also Easter, I stitched two Ostara designs. One of them is a freebie from The Primitive Hare. I stitched it in 18 count rustic Aida fabric. It ia a typical Easter/Ostara design. The other one is part of the CTHdesign’s Sabbats collection I am doing. 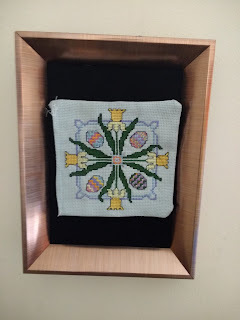 It is colourful and for this embroidery I used 14 count pale blue Aida fabric. This one contains daffodils and eggs in the design, typical from the season. Two more lovely designs! I really like the PH piece on the rustic fabric. I actually have some similar rustic fabric ..... I’m afraid I’ll be add8ng this to my long list of projects I really must stitch! Thank you for the inspiration! Two beautiful finishes to celebrate the season - I love the spring equinox.